12 x 17 inches, chalk pastel on paper. This was from my stay in New Mexico in 2003. 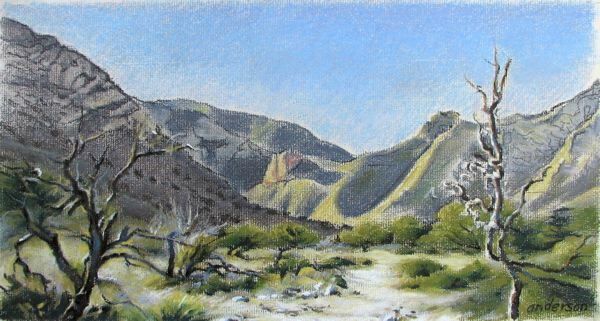 Guadalupe National Park is on the Texas/New Mexico border, along a desolate stretch of highway connecting Carlsbad and El Paso. The park highlights an ancient uplifted and exposed ocean reef, which these hills are a part of. I drew 90% of this from our car on-site, and finished it later using my reference photographs.